Vietnam’s waters are being threatened by excessive economic activities, lack of regulations and over-fishing. The problems were discussed at a conference on the first five years of a protection and development of aquatic resources programme on November 2 held by the Ministry of Agriculture and Rural Development. According to the ministry, Vietnam has 1,200 species that could be defined as aquatic resources. However, 30% of them have been over-exploited in the past five years, especially species living near the seabed. The sustainable exploitation rate is 2.45 million tonnes of fish per year, however, the real figure is 3.1 million. The ministry aimed to set up 16 marine protection areas by 2015 with 30% under strict protection. However, there has been an abject failure to reach this target, with only 10% of the area under strict protection. Many sea areas with rich biodiversity and coral reefs in Binh Dinh and Kien Giang provinces have not been protected. Bui Thi Thu Hien, representative of the International Union for Conservation of Nature in Vietnam, said the marine protected areas were being threatened by rubbish from the shore. 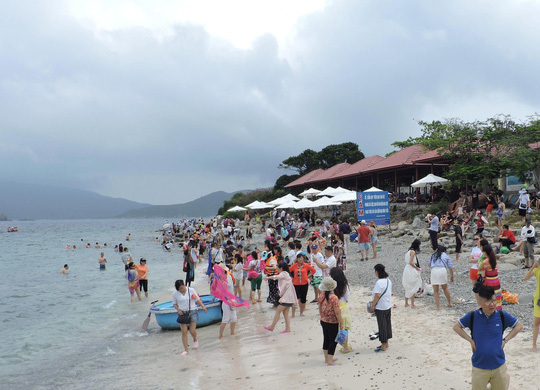 The marine protected areas in Nha Trang City, Phu Quoc and Cham Islands were already badly affected by the tourism services while the protected areas in Ha Long and Cau Island were threatened by economic activities on coastal areas. Tran Le Nguyen Hung from the Ministry of Agriculture and Rural Development said that the economic development had failed to go hand in hand with environmental protection. Many species had lost their habitat when hydropower plants and tourism developments were built. The legal framework was also lacking. “The laws only focus on prevention and protection but environmental restoration is neglected,” he said. Vu Van Tam, deputy minister of agriculture and rural development, admitted that economic interests were more valued than the protection of aquatic resources, even in marine protected areas. Few local authorities have raised their voices about pollution cases. “We need stronger and more effective warnings to protect the marine life. We also need the co-operation of the public and organisations,” he said. Talking about recent proposals to dump mud and waste into the ocean, former vice head of the Vietnam Administration of Seas and Islands Nguyen Chu Hoi said without immediate solutions, there would not be any resources left for future generations. According to Hoi, Vietnam has no regulations concerning dumping at sea. “Holding a five to seven-day meetings and reading 500 pages of a report are not enough for accurate decisions,” he said.